Not to be confused with Newtown, Queensland (Toowoomba). 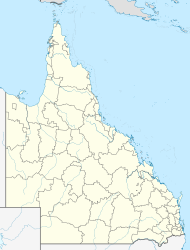 Newtown is a small residential suburb of Ipswich, Queensland, Australia. It is bordered by Queens Park to the west, to the north by Brisbane Road, the city's main arterial link to the Ipswich Motorway. At the 2016 Australian Census, the suburb recorded a population of 1,615. A small set of shops lies on the five-ways intersection where Brisbane Road, Queen Victoria Parade, Glebe Road and Chermside Road meet. Newtown is serviced by East Ipswich railway station, which provides access to regular Queensland Rail City network services to Brisbane, Ipswich and Rosewood via Ipswich. Newtown contains a number of heritage-listed sites including Rockton, a house at 4 Rockton Street and St Michaels Nursing Home at 68 Chermside Street. ^ a b Australian Bureau of Statistics (27 June 2017). "Newtown (Ipswich - Qld) (State Suburb)". 2016 Census QuickStats. Retrieved 29 March 2018. This page was last edited on 13 August 2018, at 06:55 (UTC).